Site redesign for Electric City Roasting Co.
Electric City Roasting Company owner Mary Tellie is one of the nation’s most respected names in coffee roasting and BlackOut Design recently gave her site a facelift that makes her online presence as distinctive and bold as her coffees. BlackOut’s design incorporates information about Tellie and her background in coffee; details of Electric City Roasting Company’s dedication to Fair and Direct Trade practices as well as special projects that provide immediate assistance to rural coffee farmers; and educational materials helping any reader to understand the components that go into a great cup of coffee. 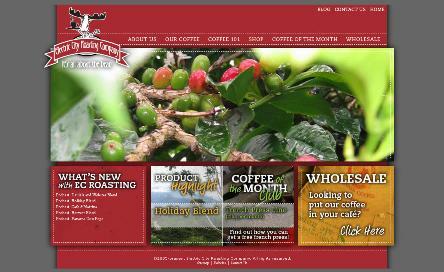 Check out the site at www.electriccityroasting.com and be sure to try some of Mary’s world-class coffees.